construction of warehouses by the Great Northern Railway. It is located in a cobbled courtyard just off of Borough High Street. The ground floor is divided into several connecting bars and boasts a wealth of oak beams. The bedchambers (now the restaurant) were in the galleried part. 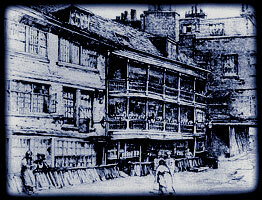 The inns of Southwark have a long, colourful and famous history. And the George Inn - which also served as a theatre was no exception. The history of The George can be traced back to 1542 although it is likely that an inn existed here for some time before. Like the other Southwark inns, the George was built around three sides of a courtyard - thus spawning the expression 'inn-yard'. Its wide, double-tiered balconies became an excellent vantage point for the plays that would be acted out below. The first theatres were built in a similar style, mirroring the galleries a major change being to shape the seating around a semi-circle rather than a rectangle taking on the features of amphitheatres. 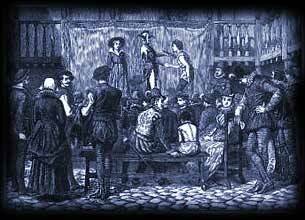 William Shakespeare lived and worked in the area of the George Inn and there is no doubt that he would have frequented the Inn on a regular basis and even possibly have played there. The George that Shakespeare knew burnt down in 1676 but the house was immediately rebuilt to the original template. It remained unchanged until the turn of this century, when it was partly demolished for the Great Northern Railway Goods Office.